One of your parents’ most important concerns, as it relates to your well-being, is your physical safety. There’s no getting around this—especially in our wired world where each tragedy involving a child is broadcast 24/7 to every corner of our nation. Today’s parents are sensitized to all of the misfortunes that can possibly befall their child. It doesn't matter whether the risk is statistically real. Where you live and play affects the potential risks you face. A tough city neighborhood is more dangerous than a gated, suburban community. You need to respect these hazards and your parents’ warnings. There are also real risks associated with playing certain sports. Years ago, parents might worry about their son playing “tackle” football because he could break his leg. Parents now also worry about their child suffering a head injury that results in a concussion. Since your parents control your opportunity to play sports, you need to recognize their concerns. 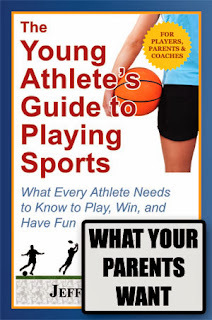 And if you independently want to play sports, you will need to come up with ways to dispel your parents’ fears. Listen to your parents’ warnings about dealing with strangers and any other potential risks that they believe you may encounter. Respect the boundaries they establish. As you get older, and your judgment matures, your parents will likely listen to your ideas on managing the risks that concern them. Be proactive about finding win-win solutions. For instance, your local YMCA, community center, or similar facility provides a semi-supervised setting where you and your friends can play. If your parents are reluctant to let you play unsupervised, they may find these facilities an acceptable alternative. Also consider how you can use technology to alleviate your parents’ safety concerns. You have an incredible array of tools available for you to communicate with your parents. Cell phones and smartphones with GPS location-based services provide your parents with a means to stay in touch with you and know where you are. Discuss with your parents how you can possibly use these tools to help satisfy both of your needs. In addition to the physical risks, parents are also worried about who exactly will be working with their kids day in and day out. Can they be trusted? Have they been pushed to submit a background check? You don't want to place your trust and the safety of your child in the hands of someone who doesn't deserve it.